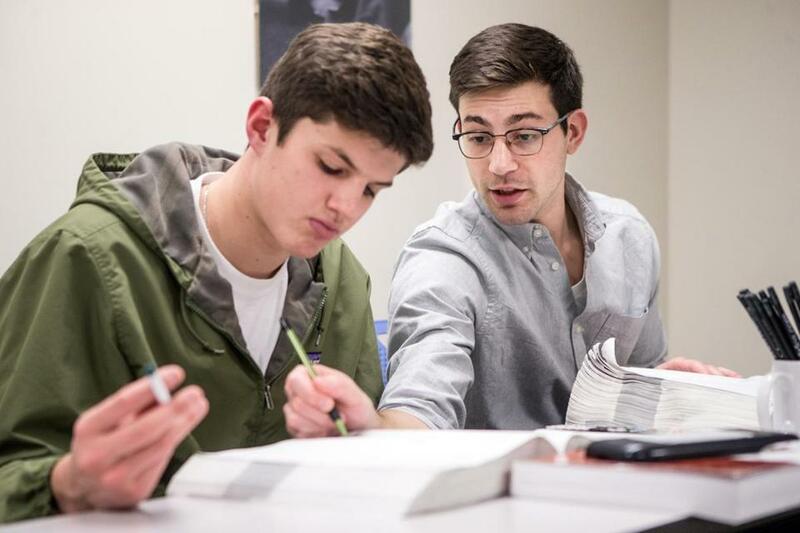 Mitch Heffernan (left), 17, of St. Sebastian’s School, worked with tutor Steve Facelle during a one-on-one tutoring session at Inspirica in Newton. The new SAT, which features the most significant changes in the test’s 90-year history, debuted Saturday, culminating months of rising anxieties for college-bound high school students and their parents. Those increased anxieties have meant booming business for the private tutoring and test preparation industry that helps students navigate the test and boost scores. Tutoring and test prep services said they have been going flat out almost since the College Board, the New York company that writes and administers the test, announced sweeping changes to the SAT two years ago. They’ve had to rewrite curricula, revise teaching materials and practice tests, and retrain tutors. The efforts have paid off. Chyten Premier Tutoring and Test Preparation of Wellesley said revenue has jumped 40 percent over the past year. Kaplan Inc., the international test preparation company, said sales of its SAT study books doubled over the last year but declined to provide figures. Inspirica, a tutoring company with locations in the Northeast, said the test-prep enrollment in its Newton office has doubled to about 120. Anytime the SAT is modified, students and parents seek assistance in droves, said Neil Chyten, president of Chyten Premier Tutoring and Test Preparation. The exam has a new design, the first in more than a decade, meant to align the test more closely with what students learn in school. The College Board decided in 2014 to introduce sweeping changes to the SAT to make it more demanding and test students on what they will probably encounter in college. A large portion of the math section uses word problems more closely related to real-life situations. Reading comprehension questions test students on their logic. An optional essay question asks students to read a passage and explain how the author builds an argument to persuade an audience. A more demanding test has meant greater demand for an industry that has nearly doubled its revenues in less than decade. In North America, private tutoring and test preparation grew to a $12 billion industry in 2014, up from $7 billion in 2006, according to Global Industry Analysts Inc., a forecasting firm based in San Jose, Calif. North American revenues are projected to reach $17.5 billion in 2020. Globally, test prep and tutoring generated $114 billion in revenues in 2014, up from $59 million in 2006. By 2020, worldwide revenues are projected to reach nearly $200 billion. Demand for private tutoring is largely driven by the desire of parents to see their kids gain an edge in the classroom and competitive college admissions, according to Global Industry Analysts. More than 460,000 people sat for the new SAT on Saturday, an increase of about 7,000, or 1.5 percent, according to the College Board. As students took the test, No. 2 pencils in hand, it capped nearly two years of work for tutoring and test prep services. Chyten started his tutoring business in 1984 and today enrolls more than 2,200 students across four locations in Massachusetts. For the past 18 months, Chyten and staff have gathered sample questions released by the College Board, rewritten study guides, trained dozens of tutors, and formulated new test-taking strategies. For example, they no longer discourage guessing because the new test does not penalize incorrect answers. All told, Chyten said he spent between $150,000 and $250,000 revamping its SAT preparation services. The company charges between $2,500 and $4,000 per student depending on the length and intensity of the classes. The Princeton Review, a New York-based test prep company with a location in Natick, studied more than 200 aspects of the test and rewrote manuals and scripts for instructional videos, said Jonathan Chiu, the national ACT & SAT content director. Multiple teams pored through every detail, from how many questions would appear in each section to when and for how long test-takers get breaks. Independent tutor Jeffrey Norman doesn’t have the resources of big test prep companies, but he also had to update his services. For example, Norman, a 25-year-old Stanford graduate who lives and tutors in Cambridge and Los Angeles, decreased his focus on geometry because geometry-based questions ware less prevalent in the new math section. Norman, who charges $40 to $100 per hour, said he spends about 10 hours per week developing new test-taking methods. He plans to continue to improve those methods by gathering intelligence on the test from students who take it. He trades free sessions to some students who agree to report back to him after taking the SAT. Hearing about the SAT changes initially alarmed Ayesha Murshid, 46, of Brookline. But she said last week her son Reeham Choudhury, 17, a junior at Brookline High School, was prepared to take the test Saturday, after months of study with a tutor from Chyten. Alex Whalen, head tutor at Inspirica’s Newton office, said parents of students taking new versions of the SAT and other high-stakes tests are wary of being caught off guard. 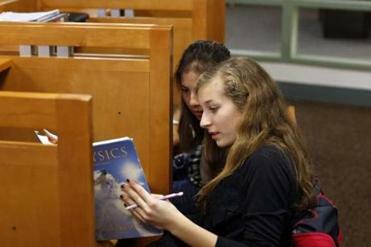 The SAT last changed in 2005, when it added of a mandatory essay question, but the changes this year are more extensive. Correction: Because of editing and reporting errors, the headquarters location of the College Board and test prep service used by Reeham Choudhury were misidentified in an earlier version of this article.